With great green eyes dominating a triangular head turning 180 degrees to each side, there's not that much escapes the notice of a praying mantis. Combined with the ability to fly away and strong fighting skills, it's hard to imagine the praying mantis becoming prey itself, yet plenty of enemies enjoy having a mantis for dinner. Few insects give the praying mantis reason for caution. Spiders will glady devour a young mantis captured in a web, providing the praying mantis is not bigger. Tarntulas and praying mantises eat each other, with the victory meal usually going to whoever is bigger. In Japan, the giant hornet's toughly armored 2-inch body is topped off with cutting jaws and 1/4-inch long stingers that make it one of the only insects consistently deadly to the praying mantis. Much of a praying mantis's daytime hours are spent sitting on plants waiting for butterflies and other insects on its menu to alight on a nearby flower. Small movements may catch the sharp eye of a hungry bird, which will swoop down and pluck the mantis from its roost. The mantis becomes more active at night, fluttering around lights as to capture insects for a meal and making it vulnerable to night-hunting bats. The praying mantis's enemies on the ground have reason to think twice before attacking. Mantises grow to 6 inches or longer, and pregnant females have been known to devour mice, scorpions, snakes and lizards. While lizards, snakes and scorpions will often eat small mantids, they often steer clear of the swift spiky forelegs and ruthless fighting tactics of the praying mantis. Frogs are another natural enemy who can kill or be killed, according to relative size. Praying mantises are beneficial predators that can work with other insects such as lacewings and ladybugs to keep garden pests under control. 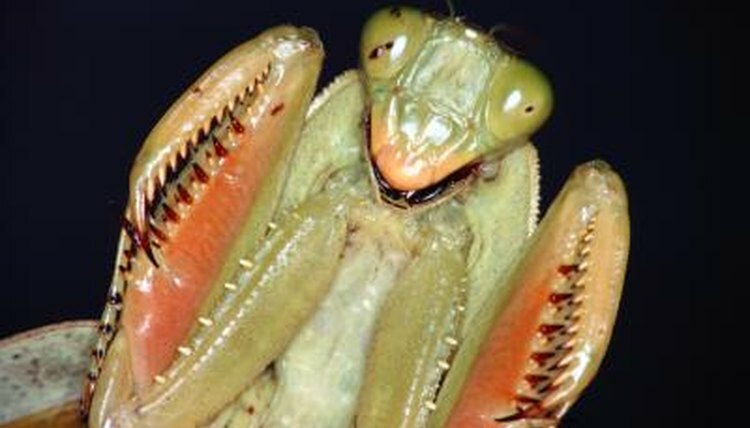 Chemical pesticides can poison bugs that can in turn poison the praying mantis. Blanket applications of chemicals to gardens can wipe out an entire mantis population, including egg cases, nymphs and adults. While the pests you were trying to kill will be back within weeks, mantises may take years to repopulate.